I think it's fair to call Thursday a pleasant, dry weather day. It will be mild — although about 10 degrees cooler than Wednesday. It will be breezy (westerly 10 to 20 mph) — not nearly as windy as Wednesday (top gust 46 mph). We'll see a mix of sun and clouds. Thursday night looks quiet too. Even thought our overhead blanket of clouds will thicken up, low temperatures should still fall into the upper 30s. Showers may creep across the Delaware River into western New Jersey just before daybreak. And Friday does look like a soggy weather day, with periods of rain and drizzle all day. It will be cloudy and uncomfortably cool, with high temperatures ranging from lower 40s (North Jersey) to lower 50s (South Jersey). The rainfall won't be incredibly heavy, with totals only between a quarter-inch to a half-inch. It's just not going to be a very pretty weather day, at all. 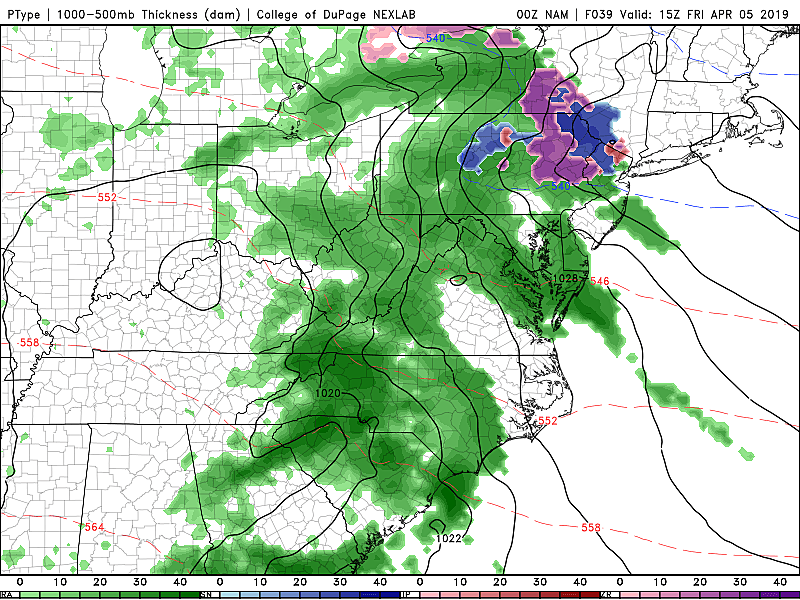 In addition, models have been pretty persistent in putting some wintry mix — freezing rain and/or snow — over NW NJ Friday morning. We're not talking about shovelable or plowable accumulations here — but there could be some slippery spots on roads, driveways, sidewalks, etc. Again, this is a mostly rain event for the Garden State — any wintry impacts will be very limited. I say could because models are really struggling on the evolution and progression of next week's storm system. I know this because each successive run of each model looks completely different. As I mentioned yesterday, the window of rain stretches from Sunday night through part of Tuesday. Depending on wind direction and air masses, high temperatures for Monday-Tuesday could end up anywhere from 47 to 74 degrees. (Wow, bold prediction there, Zarrow!) This is very clearly a wait and see situation — hopefully we'll have more clarity on that part of the forecast in the coming day(s).